I urge you to send me your wildlife photos if they’re good ones. Please limit each dollop to ten photos if you can, and, as always, include the Latin binomial. In a recent set of pictures, I had introduced antlion larvae which can be kept as ‘pets’. The business end of one of these little beasties is shown in the first picture. I think the species is Brachynemurus abdominalis. Antlion larvae of course go through metamorphosis. 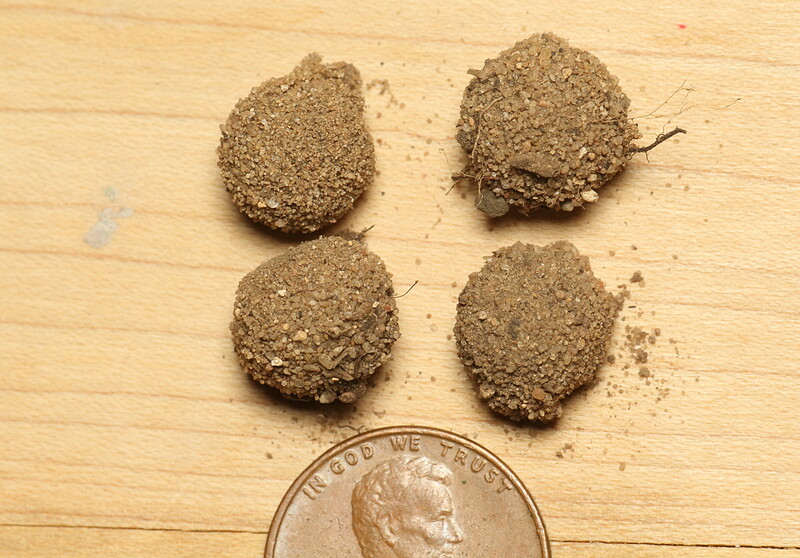 They form a loose cocoon in the sand, and some of these are shown in the next picture. Sorry about the technical violation on the separation of church and state. I was not thinking that day. The pupae of antlions are rather interesting. Insect pupae can be categorized in terms of having appendages that are either sealed to their body or held out free. Another area of classification is whether their mandibles are immobile – or not. That is, some insect pupae can bite. This appears to be mainly used to chew their way out of the cocoon before the adult ecloses. There are a few insect orders with biting, or decticous pupae, so we have here a thing that may be considered “weird but not unusual”. The insect order Neuroptera (where antlions belong) is one of the orders with decticous pupae. 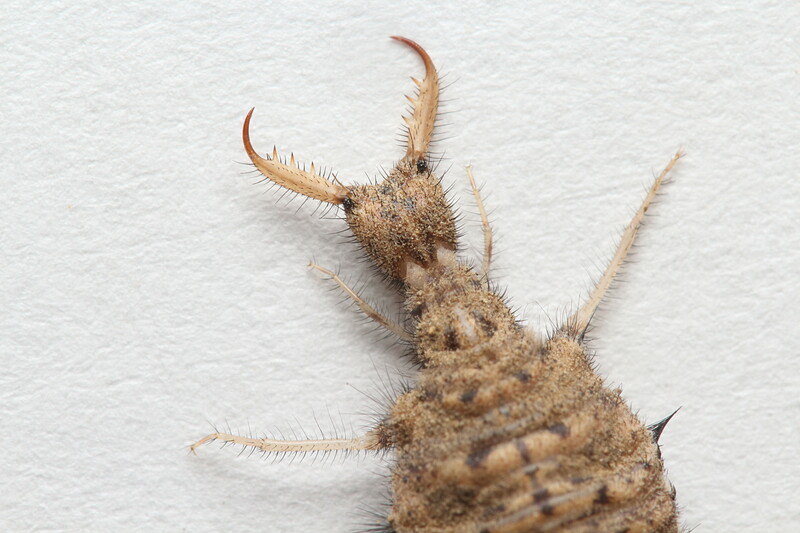 An exposed antlion pupa is shown in the next two pictures. It is rather hairy, and it turns out that the slightest touch of a hair would trigger a biting action, as you can see. These things were tetchy! 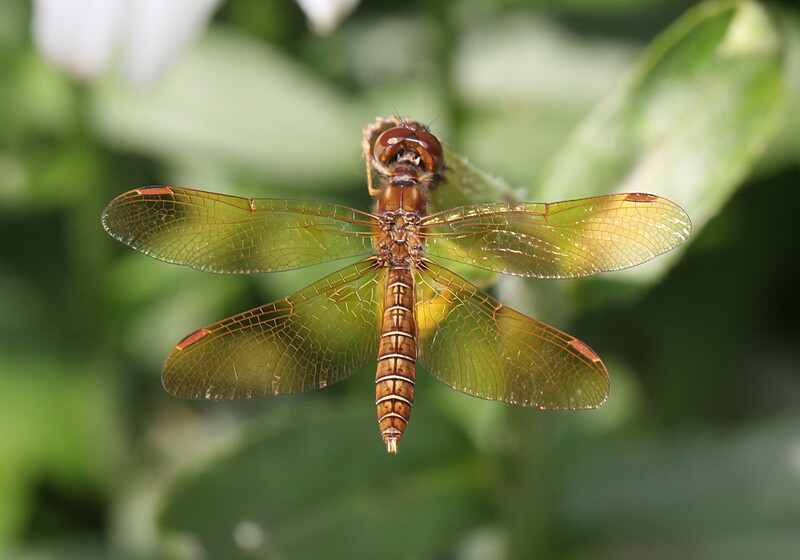 I am especially fond of dragonflies, and the next pictures show some of my favorite species. First, Eastern amberwings (Peritemis tenera) are one of our smallest dragonflies, and here is a male. 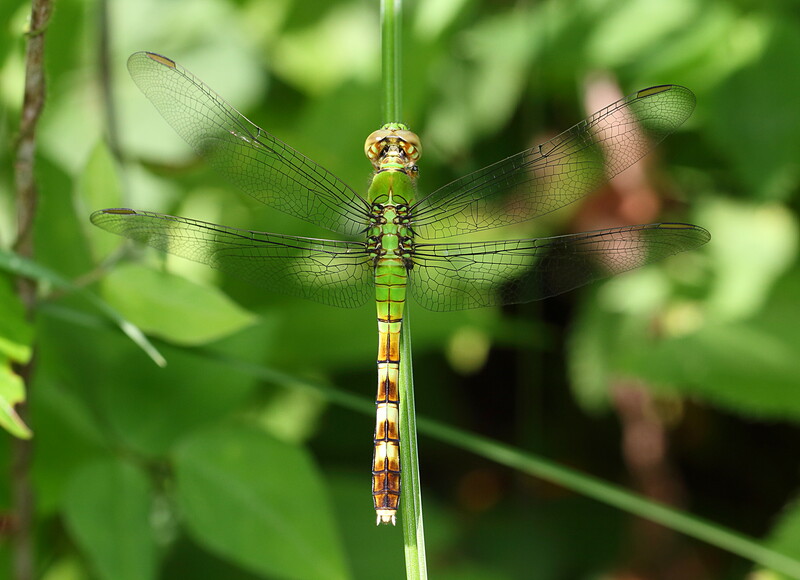 Next are larger dragonflies called Eastern pondhawks (Erythemis simplicicollis). Females are green, and males start out that color as well but they develop a lovely blue color as they mature. This male had not quite completed the transformation. 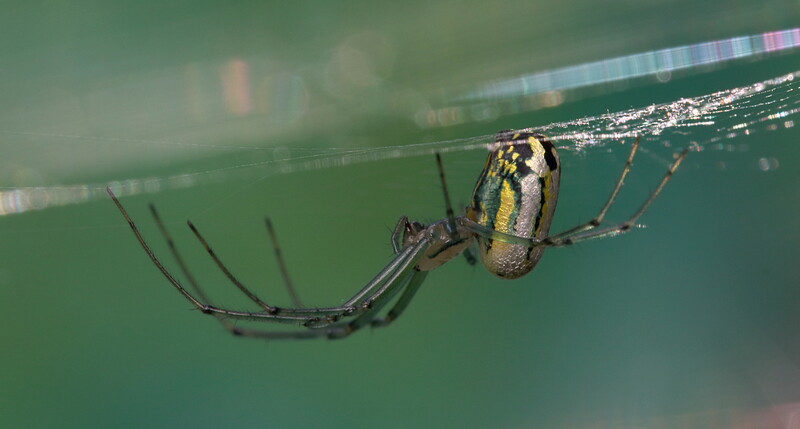 In the final picture is an orchard orbweaver spider (Leucauge venusta). These beautiful spiders like to build their web in shady places, so photographing them in low light is a bit challenging. This is because the preferred camera settings usually result in a dark background, even when a flash is used, and so the black markings on the spider tend to become lost. I had experimented with setting up a piece of cloth behind one in an attempt to give a brighter but still naturalistic background. The colors turned out to be decidedly unnatural, which was not in the plan, but they seem to ‘go’ with the colors of this spider. I like how the abdomens of these spiders look like antique porcelain. This entry was written by whyevolutionistrue and posted on July 1, 2018 at 8:30 am and filed under arthropods, insects, photography, spiders. Bookmark the permalink. Follow any comments here with the RSS feed for this post. Both comments and trackbacks are currently closed. Awesome, Mark. I watched antlions when I lived in New Hampshire and watched the ants get trapped in the sand trap. But can’t find any here in Vermont. I may just build them a sand dune. We have sandy places, but the snappers nest in them. If the two-frame gif does not cycle for you, you can force it to cycle this way: Click on the picture to isolate it, then hit the reload button on your browser. It runs the gif each time you reload. It works reasonably well that way. Beautiful photos of lively arthropods. I especially like the alert spider, perfectly focused and lit amid its web. That’s hard. Oops, this was not a response to #2.. Thanks! Of course you know the secret is to take dozens of pictures, then show 1. Great pictures, Mark! I really like the antlion ones! I’m enjoying these photos, especially double clicking on the spider and the dragonflies to look at parts of their bodies close-up. The spider’s body does look like antique porcelain or a painting with cracquelure (but I think potters can buy crackle glaze)and it becomes somewhat iridescent when enlarged. 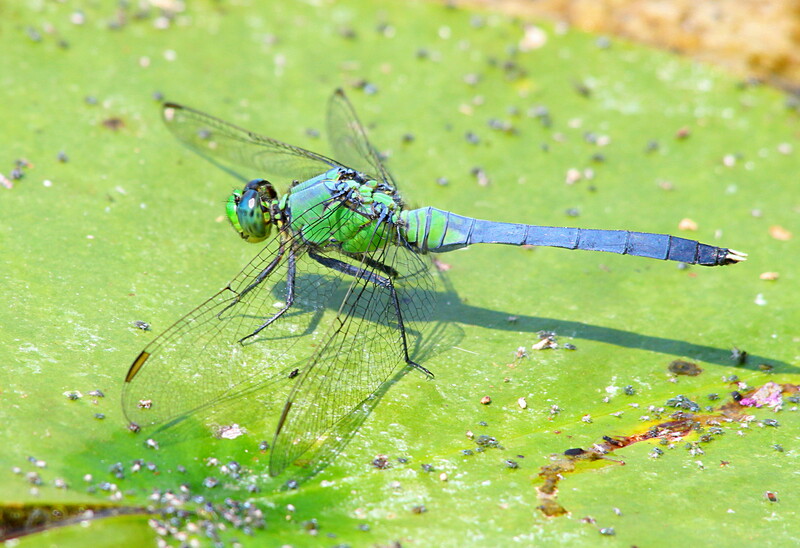 I also like exploring the male Eastern pondhawk’s body in close-up, especially its wings and abdomen. Fine shots. I’m happy you went from ant lion to pondhawk to orbweaver, in that order. Some bugs leave a good taste in your mouth. Great pics (as always) Mark. The male dragonfly is especially beautiful. The spider looks to be underwater!